Together we strive to create unstoppable momentum toward the goal of improving individual and community health through discovery, clinical and translational science and technology, exceptional education and patient-centered, innovative, high-quality health care. This is our vision as we harness The Power of Together. At the heart of our mission is to provide high-quality clinical care and to promise every patient their best experience possible at UF Health. But our objectives aren’t purely clinical. A huge part of our institutional mission is our focus on education and research. These goals are interconnected. For example, biomedical research can include fundamental scientific work in the lab that contributes to immediate or future breakthroughs, as well as highly translational clinical research that benefits patients while they are in our care. Our robust educational programs train the next generation of health care providers. Everything we do serves to move us along the path of improving health and well-being for our patients, their families and our communities. All these things together propel us forward. Our patients are at the heart of everything we do at UF Health. Our top priority is to provide the highest quality health care and the best possible experience for every patient, family member and visitor who walks through our doors. Hospitality and service are a state of mind — an approach that’s reflected in all our actions throughout the day. It starts with the way we support and treat each other as colleagues and internal customers. In turn, our relationships create the foundation for how we serve those who trust us with their care. We can make a positive impact with every interaction. By giving our caring attention to each customer — whether it is a patient, visitor or coworker — we create an environment where people feel acknowledged, understood, safe and valued. UF Health staff and volunteers who provide care and support for patients and visitors in our UF Health Shands and UF Health Physicians programs are held to Hospitality & Service Standards of Behavior. Each category includes specific behaviors that apply to all our interactions with those we serve, including each other. The words hospitality and hospital are linked by their common Latin root. Hospitality reflects the relationship between a host and a guest. The concept of hospitality has come to mean a welcoming environment providing warmth and caring. We are hosts at UF Health; our patients and their loved ones are our most important guests. We strive to determine and then meet their needs in an attentive and compassionate way. Similarly, our coworkers and colleagues from all departments are also our customers and deserve the same respect and care we provide patients and families. 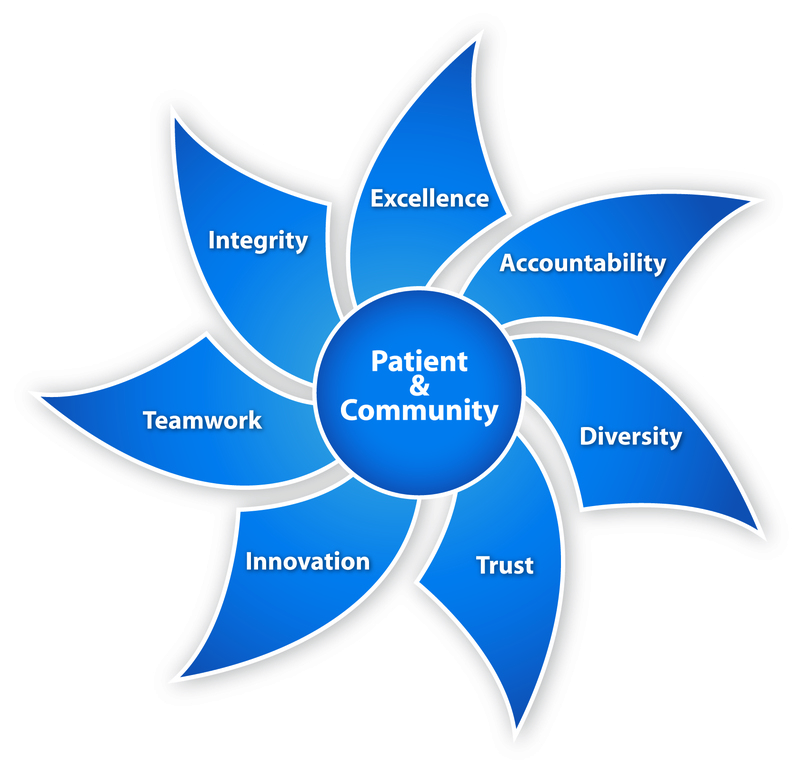 Our goal is to make every interaction warm, welcoming and attentive for everyone we encounter at UF Health. Hospitality and service start with the way we support and treat each other. Our relationships with our teammates and staff in other departments set the tone for how we behave towards our patients and visitors. We will not be able to provide outstanding patient care if we do not support each other as UF Health colleagues. Health care can be a very high-stress environment. Working cooperatively with our colleagues in a supportive team environment is critical to our ability to provide safe, quality care and attentive service. Every day, our individual actions contribute to our team’s morale, performance and accomplishments. Communication is the way we exchange information and make a personal connection that leads to excellent patient care and a positive experience for everyone at UF Health. As representatives of UF Health, we are ambassadors for an organization that stands for the best medicine has to offer. We serve patients who come to UF Health from throughout the Southeast, the nation and many countries. Their entire experience — the service and hospitality we provide — should match the high quality of medical care they receive. Our patients come to us because they trust our doctors, nurses and clinical teams to provide the best, attentive and compassionate care available. That’s why, in addition to our work performance, our actions and our appearance should be professional and serve as an extension of UF Health and its outstanding reputation. Through our skills, knowledge, good decisions and polite behaviors, each of us represents our world-class organization. Our customers’ perception of us shapes their experience.